Located within Sugarloaf Ridge State Park (2605 Adobe Canyon Road, Kenwood, 707-833-5712), the Robert Ferguson Observatory is surrounded by a protective ring of hills that reduces light pollution from surrounding cities. As the western U.S.’s largest observatory dedicated to public viewing and education, it’s a superb destination for anyone who wants to explore the heavens through powerful telescopes. For hikers, Ferguson offers the extraordinary opportunity of traversing PlanetWalk, a 4.5-mile trail through a scale model of the solar system displaying both relative planet size and relative distances between planets. The actual solar system has been shrunk more than 2,360,000,000 times, small enough to include the orbit of distant Pluto (officially reclassified as a “dwarf planet”), and large enough that the smallest planets can still be seen. In the northern reaches of Sonoma County’s Pacific coast lies one of the world’s wonderful oddities: a pygmy forest. Acidic soils and other environmental factors deprive the trees of the nutrients they need to grow normally. The result? When fully mature, they’re miniature versions of their species — just a few feet tall. Situated at the highest elevation within Salt Point State Park (25050 Highway 1, Jenner, 707-847-3221), the pygmy forest is populated with stands of mature-but-tiny Bishop pine, Bolander pine, Mendocino cypress, and even the usually-gigantic redwood tree. You can observe them closely by following the looping 3.8-mile Pygmy Forest Trail. 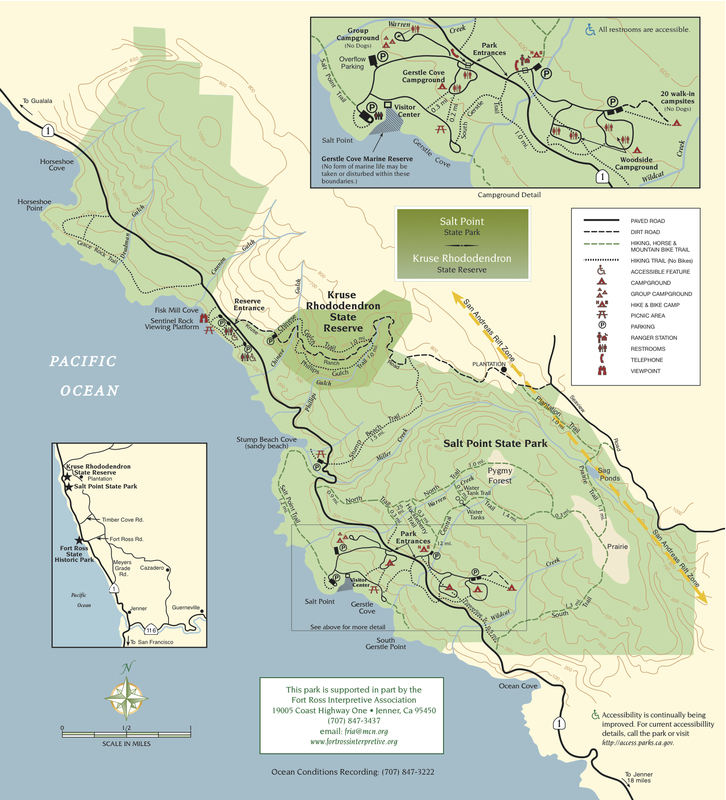 For more details read “Salt Point State Park’s Pygmy Forest in Gualala” or download the Salt Point State Park trail map. At 254 square miles, the Laguna de Santa Rosa is the largest tributary in the Russian River, as well as Sonoma County’s largest freshwater wetland complex. Consequently, it’s an important stopover destination for migrating birds and is home to a large number of bird, mammal, fish, and plant species. A hike here offers plenty of opportunity for wildlife viewing, as well as the rare wonder of being close to a thriving wetland filled with marshes, vernal pools riparian woodland, and other rich habitat. You can hike the 1.8-mile multi-use Laguna de Santa Rosa Trail (6303 Highway 12, Santa Rosa, 707-433-1625) or follow two miles of loop trails through the Laguna Wetlands Preserve in Sebastopol. Kayakers can choose between three put-in spots, two in Santa Rosa and one in Forestville. Download the Laguna de Santa Rosa Trail Guide, the trail map, or the paddling brochure for more details. Visit the full website here.